The agenda of the National Workshop for the Tanzania Education and Research Network (TERNET) the NREN of Tanzania, held on 27 April 2016 in Dar es Salaam, Tanzania risked becoming stagnant halfway through the workshop after delegates spent more time than intended, trying to understand the relationship that exists between TERNET and the Higher Education and Research institutions Network (HERIN), a government initiative that is being managed by the Tanzanian Commission for Science and Technology (COSTECH) and is connecting the country’s public higher learning Institutions to the Internet. This came after Dr. Jim Yonaz, Director of Knowledge Management at COSTECH and manager of the HERIN Project, had just made his presentation on HERIN, informing participants that the project has so far connected 27 public universities and research institutions, a task many of the participants were convinced was supposed to be carried out by TERNET, an independent entity which was registered as a Trust in April 2008. Dr Yonaz acknowledged that providing Internet services to a large number of other instutitions did not really fit within COSTECH’s mission. Dr. Yonaz and TERNET CEO Dr. Amos Nungu clarified that while TERNET and COSTECH are working together, the HERIN is a government funded COSTECH project while TERNET is an independent organisation. The emergence of this topic at the workshop once again put under the microscope, the relationship that exists between African NRENs and the governments of the countries they operate in and the impact of this relationship on the performance of an NREN. While some NRENs like TERNET exist independently of the government and enjoy full autonomy, others are set up as government entities, operating under a designated ministry and thrive on government subventions often derived from World Bank grants. In a down-the- middle scenario, an NREN operates as a government entity but is given independence to run its day-to-day affairs and be self-sustaining. 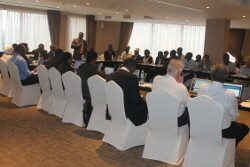 From the discussion that transpired during the “Building Successful NRENs in Africa” seminar on the following day, it was apparent that participants and NREN business gurus were divided on whether an African NREN needs to be part of the government or exist outside the government machinery to be successful. While some participants were of the view that an NREN operating withing the government set up stands a chance of benefiting from government subventions, others rooted for total NREN autonomy saying bureaucratic tendencies and red tape within the government derail the progress of an NREN, citing cases where supposedly simple and straight forward issues, like purchasing equipment or replacing a retired CEO of an NREN takes ages in the name of following complex regulations and procedures, thereby bringing important operations of the NREN to a standstill. Some observers however gave examples of successful NRENs in Europe that are operating within the government set up, but they were quick to underline the fact that these NRENs have been successful because have they manage their day-to-day operations without a strong hand from government dictating events. Questions were raised however on whether some African governments have the will and resources to fully support NRENs that are structured as projects within one of their ministries. But just when one would be tempted to believe the above raised points would make independent NRENs more viable, it turned out the story is also not all rosy for some independent NRENs. While they might be spared from the government red tape, some independent NRENs face serious funding problems as they are in some cases wrongly regarded as commercial entities inillegible for government funding. In some countries, governments have struck deals with commercial Internet Service Providers (ISPs) to provide Internet connectivity to major public universities and research institutions, effectively shutting out NRENs from providing this role. In such a case, it can be argued that government has actually become a detractor to the NREN. From the discussion, it was clear each scenario has own merits and demerits and that there is a need for stakeholders to explore best practices that can enable NRENs to thrive regardless of their relationships with the government. But for now, the seminar agreed, it is important to encourage independent NRENs to lobby their governments to recognise and allow them work together with government entities or projects that are aiming at providing bandwidth to universities and research institutions. In the exemplary case of TERNET and COSTECH for example, a healthy relationship between the two should allow COSTECH to deploy last mile connections to public institutions but allow TERNET to operate the HERIN network and provide Internet services to the institutions. In this scenario, TERNET, and not COSTECH would be the entity that invoices the universities and research institutions for the Internet services delivered via the Government-funded HERIN network, a development that would ensure that TERNET generates its own revenue and boosts its financial health. A win-win situation for both the government and the NREN.